It’s Julia Child Restaurant Week. Bon Appetit. 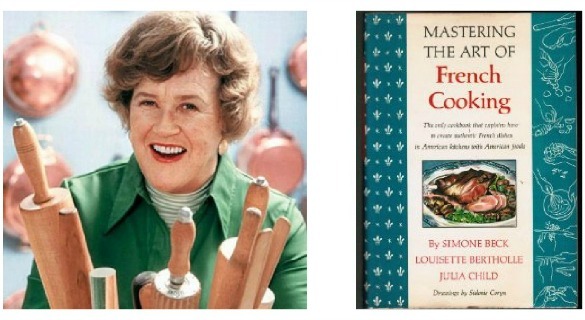 It’s Julia Child Restaurant Week through August 15 in celebration of what would have been the culinary legend’s 100th birthday. There are 100 restaurants participating with special menus across the nation with eight from her hometown of Pasadena. Those celebrating in Pasadena are: American Bistro, Bistro 45, POP Champagne and Dessert Bar, The Still Room, The Royce at the Langham, Vertical Wine Bistro, Maison Akira and Cheval Blanc Bistro. Los Angeles restaurants include: Comme Ca, Church & State, Jar, Kendall’s Brasserie, Taix French Restaurant and the Tavern. Be prepared to enjoy Beef Bourguignonne and more. And don’t forget what Julia Child once famously said, “If you’re afraid of butter, use cream.” Bon Appetit. Don’t miss “dollar days” at Jamba Juice through August 1o. Get a 16 oz. drink for $1 from 9 a.m.-11 a.m.
Next Wednesday, August 15, Fab’s Corner Cucina in Sherman Oaks is hosting Tolosa Winery for a special four course wine pairing dinner (plus amuse bouche) featuring guest chef Rico Mandel. The menu starts with an Amuse of Roasted Peach with Pancetta Lardons and Treviso, followed by a first course —Lobster, Heirloom Tomato & Watermelon Salad with Hazelnuts and Truffle Oil; Second course — Prosciutto Wrapped Chicken Roulade Stuffed with Sundried Tomatoes and Greens, with Asparagus and Sage Cream Sauce; Third course —Venison Chop with Baby Artichoke Hearts, Chantrelles, Summer Squash & Hibiscus sauce; Fourth course—Poached Apricots, Ricotta Mousse and Chocolate Dipped Almond Florentine with Blackberry Syrah Sauce. Each course is paired with wine. $65 per person or $120 a couple. Call (818) 995-2933 to RSVP – or click here for more info. Oliva Trattoria in Sherman Oaks is having a series of three wine five-course wine dinners. The first is this Monday, August 13 and the cost is $85 per person (plus tax and gratuity). The other dates are September 24 ($65 per person) and October 29 ($100 per person).Check out the menus here. Le Pain Quotidien has opened its third 818 location at 15503 Ventura Boulevard in Encino (at Firmament, west of Sepulveda). The hours are 7 a.m.-8 p.m. daily. Other nearby locations are in Studio City and the Calabasas Commons. This casual French/Belgium eatery is an international chain known for its organic and sustainable menu, including breads, pastries, egg dishes, tartines, salads and a variety of teas and coffees. This location boasts a large outdoor seating area. Umami Burger just opened its twelfth location at The Grove. This one is the largest to date and considered its flagship location with seating for 85 indoors and 100 on the outside patio. Special to this location, which is just a jump over Laurel Canyon, is The Grove Truffle Burger ( beef patty topped with a parmesan fondue and truffle sauce). Also on the menu — kids menu — the Umami Dog, Umami chips, milkshakes and special eats for kids. The restaurant is located near the parking lot on Fairfax, just on the edge of The Grove. Each Umami is different, so perhaps shake up the endless wait line in Studio City and jump over the hill! From heirloom tomato and crispy mozzarella salad to rock shrimp and peaches, Roy’s Restaurant in Woodland Hills celebrates the warm weather with the launch of its Summer Prix Fixe Menu. Roy’s guests will experience a taste of summer infused cuisine with the restaurant’s signature fusion style for $36.95 per person. Appetizer options include Bulgogi Chicken Satays, Rock Shrimp & Peaches and Heirloom Tomato & Crispy Mozzarella Salad. Entrée choices consist of Teppanyaki Mahi Mahi, Steelhead Trout and Porcini Dusted Hangar Steak. Guests can also choose from two of Roy’s unique deserts, the White Peach “Mousse” or Roy’s Melting Hot Chocolate Soufflé. Maryland Soft Shell Crab has arrived at King’s Seafood in Calabasas. Choose from: Southern Fried Soft-Shell Crab with remoulade, coleslaw, and French fries (lunch: $20.45, dinner: $24.45); Soft-Shell Crab Picatta Style with lemon, butter and capers (lunch: $20.75, dinner: $24.75); or Tempura Style Soft-Shell Crab with ponzu sauce (lunch: $20.95, dinner: $24.95).